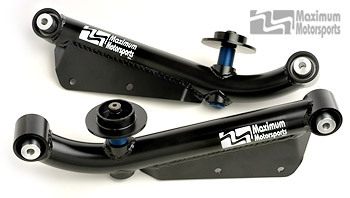 Maximum Motorsports Extreme-Duty series Adjustable Rear Lower Control Arms for the 1979-1998 Mustang improve traction and handling by reducing the unwanted deflection allowed by the stock soft rubber bushings and flexible stamped steel control arm. Spherical bearings at both ends of this control arm eliminate the deflection that can cause wheel hop, yet also allow the articulation required for proper handling. Adjustable ride height lets you change your Mustang's instant center location to tune the anti-squat percentage for optimum traction. Fits 1979-1998 Mustang with solid rear axle. 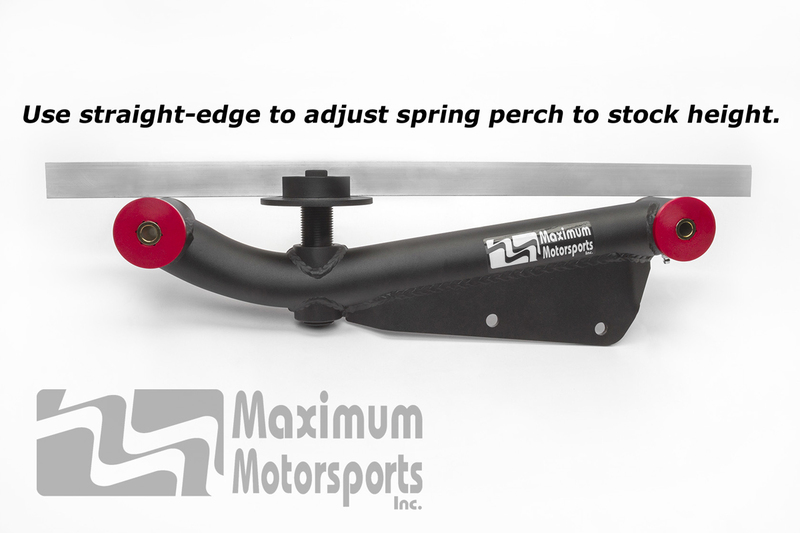 Includes spring perch and swaybar mount. Why should I use the Extreme-Duty control arms instead of the Heavy-Duty series? Mustangs with over 400 rwhp, and even those with less power that are launched hard from a standing start, may overload urethane bushings, leading to premature failure of the bushing. When you hit your Mustang's throttle pedal, all of the forces accelerating your car pass from the rear axle housing through the lower control arms and their bushings; that's what moves your Mustang forward. The harder the car accelerates on launch, the greater the forces on the lower control arm bushings. Higher forces lead to a shorter lifespan of urethane bushings. The oversized spherical bearings used in the MM Extreme-Duty adjustable ride height control arms are robust enough for a Mustang with 600 HP launching on slicks. What if my Mustang has over 600 rwhp? 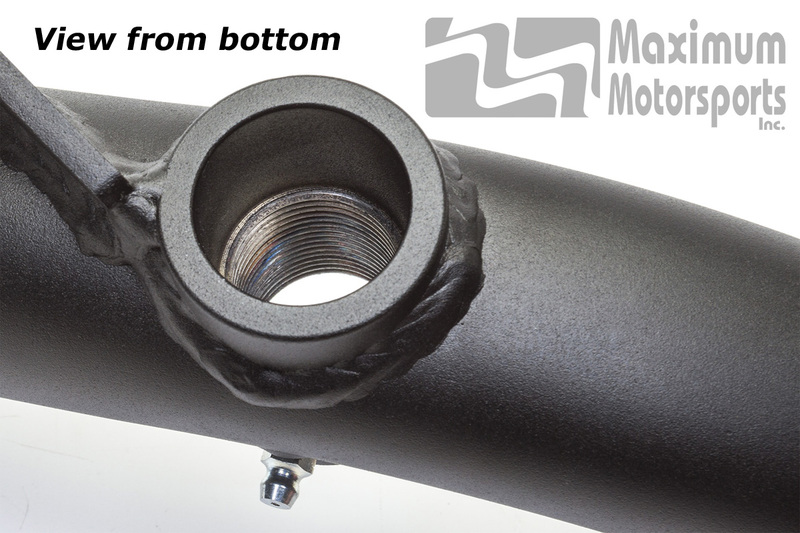 MM's Drag Race series control arms are rated at 1,000 ft-lb of torque at the rear wheels. Stress on the chassis torque-boxes is greatly reduced because the MM design allows proper articulation of the rear suspension. Spherical bearing at each end allows proper suspension articulation, while completely eliminating bushing deflection. Large 2" diameter round steel tube design for highest strength. Why do I need MM Rear Lower Control Arms? The stock Mustang rear lower control arms are fitted with very large, soft rubber bushings. Those bushings allow the axle to shift fore and aft, causing the toe of the rear tires to change. Toe changes cause instability as the rear of the car steers itself in unpredictable directions. The rubber bushings also allow axle wind-up during acceleration, which in turn causes wheel hop. MM Extreme-Duty Rear Lower Control Arms were designed by our engineering team to completely eliminate fore/aft movement of the axle, while also retaining the suspension's ability to properly articulate. This improves performance with just a small compromise in ride quality. Potential torque-box damage is greatly reduced because the MM design allows the suspension to easily articulate. Adjustable ride height feature lets you change your Mustang's instant center location to tune the anti-squat percentage for optimum traction. Manufactured by MM in the USA. Deletion of the swaybar mount is available by clicking on the option button above. Improved traction by eliminating excessive deflection allowed by stock rubber bushings and stamped steel control arm. Greatly reduces occurrence of wheel hop, usually enough to allow removal of quad shocks. Ability to adjust rear ride height allows corner-weight changes, weight-jacking, and fine-tuning ride height to suit your preference. Adjustable ride height feature allows changing your Mustang's instant center location to tune the anti-squat percentage for optimum traction. Improved handling, stability, and predictability by more precisely controlling movement of the rear axle. Unique design with spherical bearings allows proper suspension articulation. Reduced possibility of torque-box damage because the MM design allows the suspension to articulate properly. Spherical bearings cause only a slight change in NVH, maintaining good street manners. 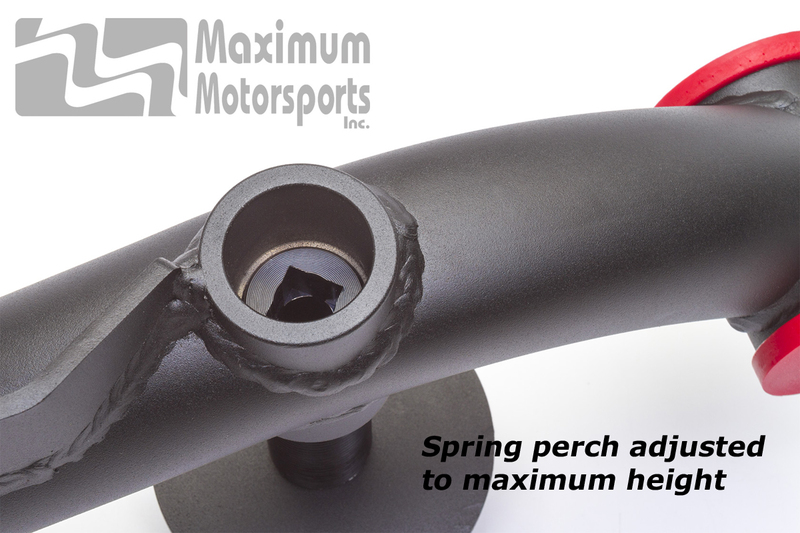 Easy-to-adjust spring perch allows ride height changes without the need to jack the car up and off the ground. Spring perch fits stock springs and aftermarket springs with an isolator. 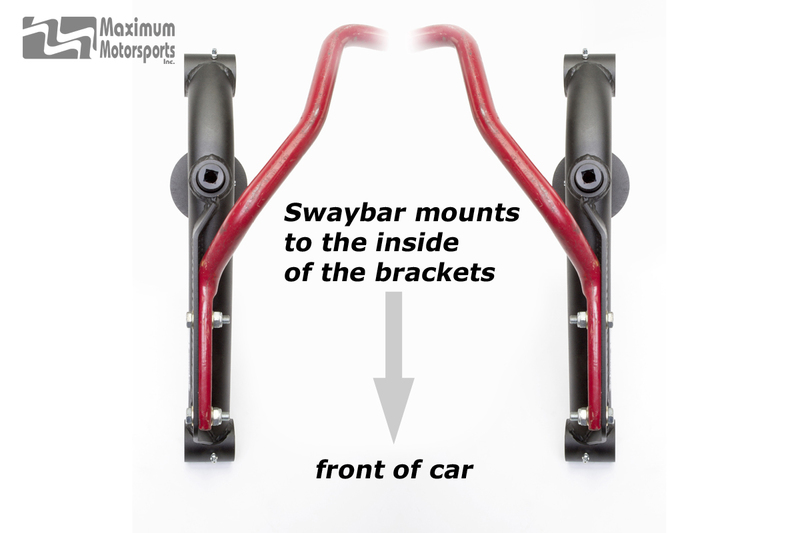 Swaybar mount fits stock and aftermarket swaybars. Made by MM in the USA. Beware of poor quality copies made overseas. We are working on FAQs for the MM Rear Lower Control Arms. If you have a question, please use our Contact Us page to email your question to us. We will answer your question by return email, and also consider your question for possible addition to our FAQs. Can I use the MMRLCA-32 in a street or road racing application? Yes. The spherical bearings transmit only a little more noise and vibration than do urethane bushings. Spherical bearings allow all of the articulation needed for proper suspension movement, so there is no binding to hurt handling. You can read Maximum Motorsports' detailed MMRLCA-32 Rear Lower Control Arm installation instructions before purchase.